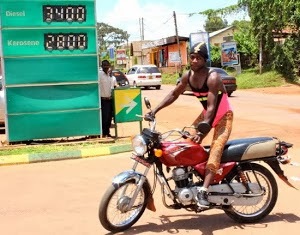 Bodaboda Baby: WINNING. 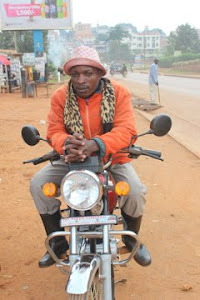 The boda who had a bet with yours truly over a helmet - and ended up with a "contract". WINNING. 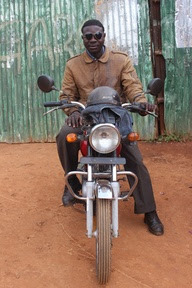 The boda who had a bet with yours truly over a helmet - and ended up with a "contract". 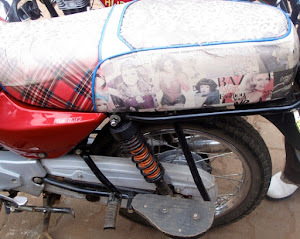 Following my two boda accidents and the sad news about Allison Malacara (I'll hopefully have a tribute post to her up soon), it's time to rewrite my boda rules. 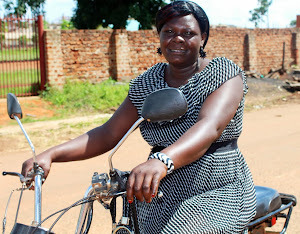 Number one (this will really get me in the good books with Mum): no helmet, no boda. 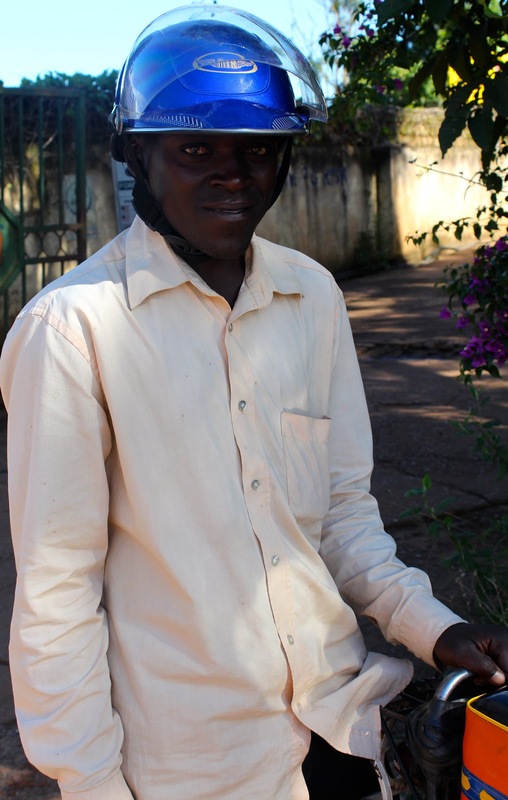 Yes, of course it's BYO helmet for the author of this blog. In fact I just walked back home from Cafe Kawa Muyenga in the dark, rather than go less than a kilometre down the road without a helmet on as I didn't take it with me. 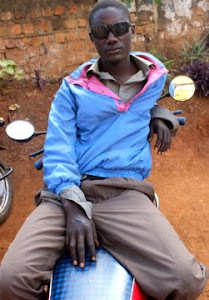 But from this day onwards Bodaboda Baby will not (not) continue to keep drivers who do not wear protective headgear in business and on the road. She does not care how late she is, either. A brief explanation for this: 1. 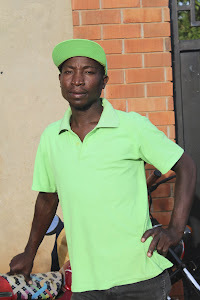 The selfish reason - buying, maintaining and wearing a helmet (ON YOUR HEAD, AS OPPOSED TO THE FRONT OF YOUR BIKE WEARING IT) demonstrates that you value your life. 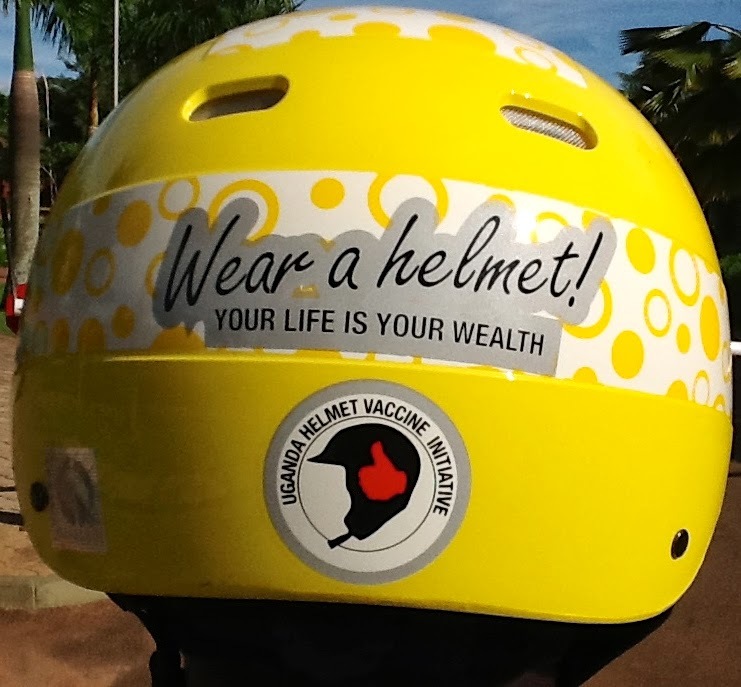 Not buying, not maintaining and not wearing a helmet shows you do not value your life. If you do not value your life you are not going to value the life of your passenger. Simple. 2. 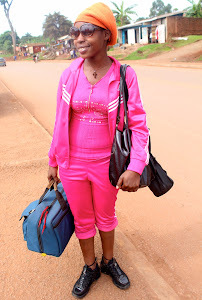 Yours truly refuses to be implicit in the death of someone on the road, a driver who has been transporting her. 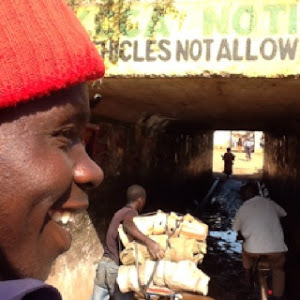 Someone who likely has a family and friends and had the potential to make a contribution to Ugandan society. 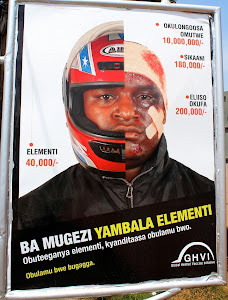 So no helmet = no boda. That's it. And the author of this blog will not be afraid to tell drivers (even at the risk of sounding like her mother, and that's a great risk, JOKE) upfront that she will not swing even one leg over their bike until they put a helmet on, which is what she told Ali, 25, when he stopped for her out the front of Prunes this afternoon. 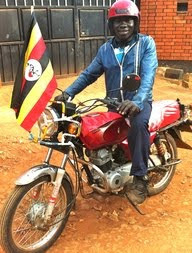 Ali, as he confessed to Bodaboda Baby, is a rider of two years originally from Kabale who was given a helmet when he purchased his bike in Kampala. Unfortunately, he lost it. Let us not hold that against him. The author of this blog would lose her own head if it wasn't screwed on. 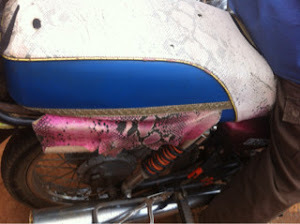 She actually lost a couple of her own helmets last year. So she is not one to judge on this occasion. After recent events, however, yours truly no longer gives a used lipstick about messing up her blow dry by wearing a hard hat, and she now has zero tolerance to drivers who don't share her views. 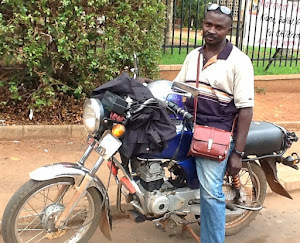 This afternoon though Ali, who spent a month in hospital last June after a car knocked him off his bike, was given a second chance after the author of this blog all but gave him a "contract" to chauffeur her around Kampala when he went across town and bought a new helmet, especially for her. 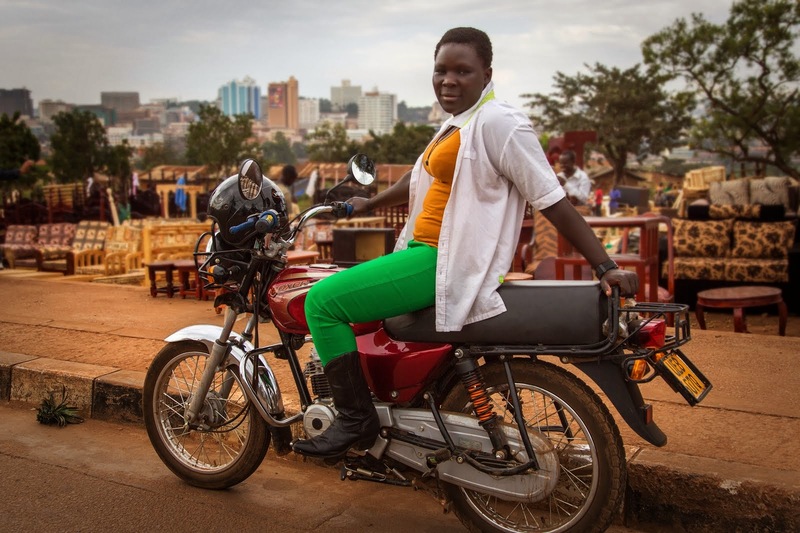 (She use the term "contract", although most boda drivers she's heard use the phrase have done so loosely. It seems that to most "contract" means being a regular driver, not actually having something in writing). Proudly showing off the new armour. 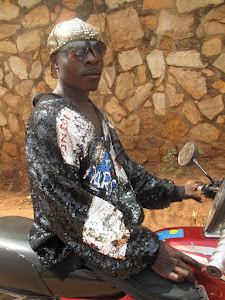 Yours truly, sporting a short black and white polka dot dress, had simply refused earlier to get on his bike, ordering him to go and buy helmet as a matter of priority if he wants to be her boda man. To her shock, he said he would do just that. BB gave him a week. 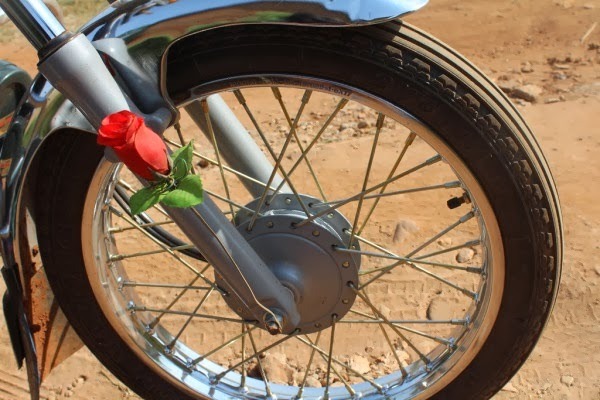 She nearly fell down a pothole when Ali rang her, about 30 minutes later, to tell her he was on his way to Acacia Avenue, where she now was (just guess what she was doing?) and that he had new armor. Wow, the Gestapo-like tactics she picked up from her mother must have really worked (JOKE). "I'm happy (I bought the helmet)," said her new taxi, who swore black and blue he purchased (not stole or borrowed from a mate) the electric blue number from downtown. 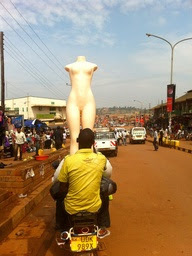 Considering how shiny it looks, Bodaboda Baby will give him the benefit of doubt. Sharp colour. 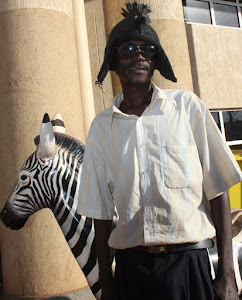 Ali said he earns about 50,000 ($19.56) on an average day. "If I can get (more) money, I can start a business, like a shop (in the future)," he said. 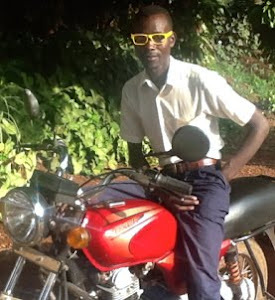 With Bodaboda Baby now on his books, anything is possible. Ali, in fact, even told the author of this blog, only an hour or so after meeting her, that he might go to "America, where you're from". "That is very good news indeed," she said, thinking well at least he didn't say Austria. He's so keen that he also rang her, only an hour ago, to ask "where are we going tomorrow?" She didn't have the heart to tell him about the song called If Tomorrow Never Comes, which was only released for occasions like this. Just kidding. The moral of the story, boys: Have a bet. Buy a helmet. You might be surprised what happens. Geez it's a hard life. 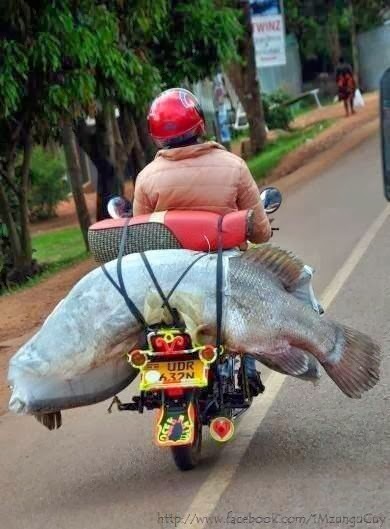 In other news, Bodaboda Baby can't help but see a remarkable similarity in attitude between one of her regular drivers, Mike, owner of that one glove, pictured here after taking her to Bugolobi last week, and Uganda's President M7, photographed in very deep thought at the London Conference on Somalia. Do you see what she's getting at? ...Lol. Amy I love yo writing style, almost "boda-ring" on satire. I used to write like you [check out my Notes on my FB page]...and you bet, I am hooked to this blog. Dudes, Have a bet. Buy a helmet. You might be surprised what happens.